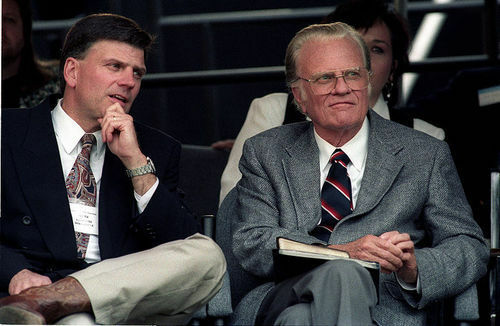 Franklin Graham, son of famous evangelical mega-preacher Billy, was invited to speak at the Festival of Hope in Iceland, but he may be looking out into an empty auditorium after an ingenious mass protest of the event in which people claimed all the free online tickets with no intention of going. Graham claimed that God grieved the day Obama came out in favor of gay marriage; Iceland had the first lesbian head of government in history. He’s also scheduled to speak the day before Pride, which is a big deal in Iceland. He’s also said a ridiculous number of ridiculous things about Islam. The Icelandic protest is kind of like the tactic employed by my hero, Jacob Isom, the guy who took the Quran from the conservative Christian activist who was going to burn it, except with maybe a bit more coordination and a sense of playfully serious mischief worthy of the land where more than half the population claims to believe in Huldufolk (elves or hidden people).